This isn’t just about the Olympics: it’s the beginning of a new phase in North-South relations, and the start of the decoupling process that was begun, accidentally, by Donald Trump. North Korean dictator Kim Jong Un’s New Year’s speech did get some coverage here in the US, but mostly the part about how he boasted that he has a “nuclear button” on his desk and that his newly-created nuclear deterrent force is within range of the United States. This provoked the expected expressions of belligerent panic from all the usual suspects, including Rep. Ted Lieu (D-Beverly Hills), who seems to spend most of his time tweeting about how President Trump is about to blow up the world (or else hand it over to Vladimir Putin). Even as Trump and Kim were exchanging escalating insults over the past few months, the lines of communication were opening up between North and South Korea – and reaching Washington. Around mid-December South Korean President Moon Jae-in requested that the regularly scheduled military provocations/exercises by joint US-South Korean forces, designed to simulate an invasion of the North, be postponed until after the Olympics: Trump, for all his alleged testosterone-driven aggression (imagine all that “toxic masculinity”! ), readily agreed. That led to the Panmunjun “peace village” meeting in the demilitarized zone and the start of talks where the North agreed to send athletes and an entire delegation to the Olympic games and to continue ongoing talks with the South on lessening tensions. President Moon is a liberal who has long pushed for the renewal of the “Sunshine Policy” that opened relations with the North in the late 1990s up until 2008, until it was sabotaged by George W. Bush and his “axis of evil” crowd. He gives Trump “big credit” for Kim’s surprising concessions and speculates that perhaps a few threats here and there, rather than just happy hippie talk, is an essential ingredient of any successful deal with Pyongyang. North Korea today is depicted as practically an alien civilization peopled by soulless robots who move in unison according to the dictates of the Supreme Leader: that’s why it’s so easy for H.R. McMaster and his fellow demons to plot and scheme a “limited” military strike on North Korea because Kim is not to be permitted to possess nukes capable of hitting the US, even theoretically (they probably don’t have the aiming device perfected). But of course, several countries already possess this capability, among them one of the most radical Islamic nations on earth: Pakistan. Why wouldn’t deterrence work with Kim, as it worked with Stalin and others? Indeed, we can see it working now even as Kim initiates peace talks. It’s easier to murder people thousands of miles away whom you don’t know and don’t see, and this is how North Korea is going to overcome this obstacle to peace: by sending their two best skaters to the Winter Olympics. Ryom Tae Ok and Kim Ju Sik have already qualified to compete in the Olympics after training in Canada, but Pyongyang failed to register them in time: however, the International Olympic Committee has stated that some accommodation can be made. 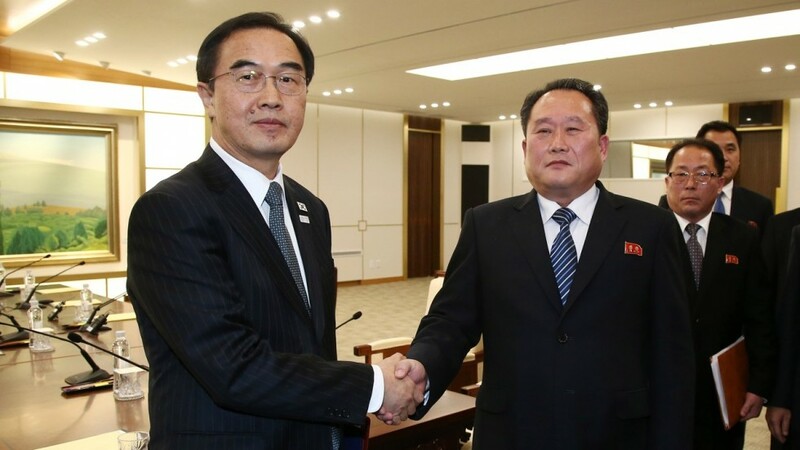 In any event, the pair (see below) will personalize the stakes in the Korean standoff, which will be briefly interrupted to make way for the international games that have always stood for the potential for peace. Defying the international sanctions that have isolated the North, the South Korean government is paying their way, providing lodging, and granting them every amenity. As Ryom and Kim perform their complicated routines with unbounded skill, we in the West are going to look at them with a question on our minds: Do they really deserve to be vaporized because of a war that ended nearly 70 years ago? This isn’t just about the Olympics: it’s the beginning of a new phase in North-South relations, and the start of the decoupling process that was begun, ironically, by this President when he brought up the US-South Korean trade imbalance and raised the possibility during the presidential campaign of withdrawing US troops and having the South take care of their own defense. This no doubt got the South Koreans – particularly then-candidate Moon – to thinking that maybe it’s time to strike out on a more independent course … and start putting Korea first. Old-style leftists typically characterize the US-South Korean relationship as a colonial one, with the US benefiting and the Seoul in a distinctly subordinate position. But this is highly inaccurate: indeed, one could argue precisely the opposite. For here’s the deal we made with Seoul after the non-conclusion of the Korean war: we get to occupy your territory, pay for your defense, and guard you against invasion from the North. You, on the other hand, get to ship your goods to the US mainland paying virtually nothing: no tariffs, no phony “standards,” no labor agreements – “free trade,” albeit on a one-way street. The moment Trump questioned this arrangement the entire basis of the US-South Korean alliance was without any real foundation except the fear that the North might invade. And now that Kim has put this fear to rest, albeit temporarily, the road is open to better relations, growing links, and perhaps even eventual reunification – the stated goal of both Seoul and Pyongyang. Yes, they said Donald Trump was going to start World War III on the Korean peninsula: they were certain of it! They were eagerly anticipating it, and, while it would surely be in poor taste for these worthies of #TheResistance to register their deep disappointment, nevertheless you can sense it as surely as one can feel their drooping spirits as the Russia-gate hoax fades into vaporware.